nice music. nice everything. just, wtf is a facebook cracktro? on a c64? wtf? 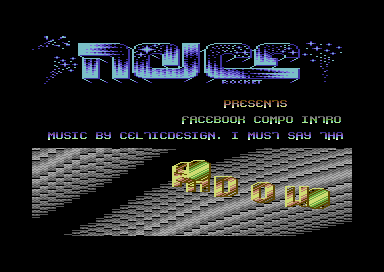 Essentially there is a group on Facebook for C64/Amiga sceners, and someone got the idea to have a compo where people should write something that looked like the crack intros from the old days. This is my entry. thumbs up for looking and sounding nice! super sweet tune, nice logo. blast from the past. Good, maybe will be better with colored or RGB rasterbars. Nice for a cracktro compo. added on the 2011-02-28 19:18:54 by w00t! Seen... Well, like the musics, good graphics also if I see that scroller a bit slow. It's an honor for facebook. page created in 0.015393 seconds with 15 queries.